Why worry about tooth grinding? You can grind your teeth down so low you’ll need major fixes like implants, crowns or even false teeth. You could chip or fracture your teeth or work them loose. Even implants and crowns can be damaged. In time, you could wear off parts of your tooth enamel, exposing the deeper layers and leaving the tooth more susceptible to decay and pain. You could experience pain in your jaw, face or neck or in or near the ear; headaches also are common. You may chew on the inside of your cheek while you grind. Tooth-grinding may disrupt your sleep or even wake your partner. If you notice any of these symptoms, bring them to the attention of your dentist at your next visit. Stop drinking caffeinated beverages, which can worsen anxiety. Do not drink alcohol, which tends to intensify grinding. Do not chew anything that isn’t food, including gum. Relax your jaw by applying warm, moist heat – a washcloth works fine for this. Ask your dentist about wearing a night guard. Molded to your teeth, either top or bottom, a night guard protects your teeth and gums when you do try to grind and can eliminate jaw pain. One newer treatment that might help: Myofunctional therapy. 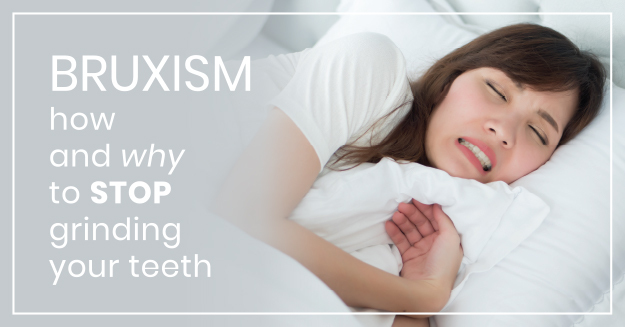 Bruxism is most often a muscle disorder rather than an issue with your teeth, and myofunctional therapy uses face and jaw exercises to retrain your muscles for proper breathing, chewing, swallowing and tongue position. The exercises are simple and painless but have proven effective for many patients. If your bite is a factor, your dentist may recommend braces. Malocclusion and missing or crooked teeth are frequent factors in tooth-grinding. Having your teeth straightened will allow your upper and lower jaws to fit together as they should, often eliminating the urge to grind. Only your orthodontist can determine if braces will help, however. If you and your ortho do decide on braces, you may want to eliminate or reduce your bruxism first. Invisalign trays, especially, can be affected by the motion of grinding, and the temporary discomfort of all braces can increase the intensity of the grinding. It is possible to wear night guards with some braces, and your orthodontist can adjust or replace them as your teeth are repositioned. When your course of orthodontic treatment is finished, and you love your new beautiful smile, your anxiety may diminish as well – which in turn can reduce your grinding. If you have questions or want more information about tooth-grinding, contact our office for a free consultation.